Since launching Stacksmith this spring, we have been busy collecting feedback from our early enterprise customers in order to prioritize new feature developments appropriately. One of the consistent pieces of feedback we heard, whether they’re using Stacksmith to move-and-improve existing applications to the cloud, or upgrading their software delivery pipeline for containerization, has been the need for Stacksmith to work seamlessly with existing systems, tools, and workflows. We’re happy to announce several new features now available to address these requests. Here is a brief overview of the most important improvements. Oh, and if you are interested in getting a personalized walkthrough of these new features and / or Stacksmith in general, please email our Customer Success team at customersuccess@bitnami.com and we will be happy to set up some time with you. Developers typically use a version control system as a 'source of truth' for their application code, and GitOps encourages operations, security, and support teams to follow similar practices. 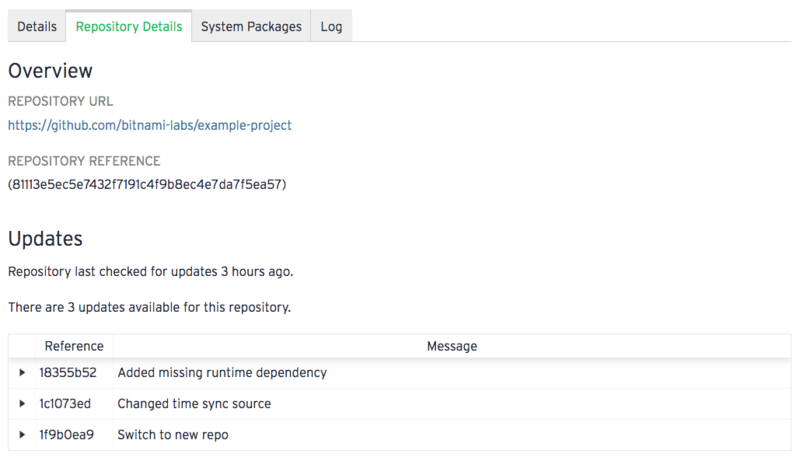 Now, Stacksmith aligns with this best practice via its support for Git repositories. This new feature enables application runtime configurations and app customization scripts to be stored and tracked from a Git repository. This means you no longer need to upload your build and configuration scripts manually to Stacksmith. You can now simply place them in your repository, provide the repository URL to Stacksmith, and Stacksmith will fetch them from there. To make things even easier, Stacksmith continuously monitors your repository, and will show when and what changes have been made. For example, if you need to make an OS configuration change, add new application dependencies, or modify your boot logic for your application, all you need to do now is update the script and check it in to Github. 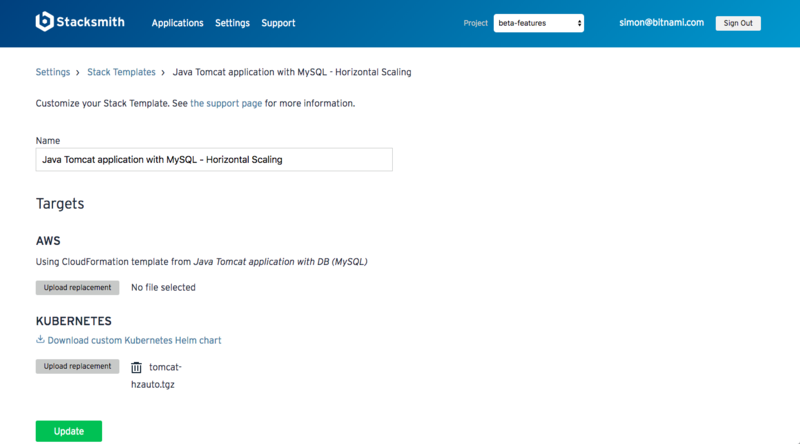 This new feature is a another great example of how Stacksmith makes it easy to keep your applications up to date and secure while further automating your code to cloud pipeline! Stacksmith currently supports public Git repositories with this feature. If you would like to connect to a private repository that requires authentication, please contact us at customersuccess@bitnami.com. The Stacksmith packaging process produces not only a VM or container image, but also the deployment template you will need to deploy your image on your target platform. Stack templates are the place in Stacksmith where the policies that will end up in the deployment template are defined. Stacksmith provides a set of default stack templates that cover most common scenarios, but some companies want the ability to customize these templates to their specific requirements. Now you can. The Stacksmith administrator can now create customized stack templates, and make them available for others to use in the packaging process. This gives the operations team a tremendous amount of flexibility in defining what the final deployment template will include. For example, it lets them add extra options at deploy time, define additional services like load balancing for the application, establish that the application should be exposed on a public IP, specify that a specific database type should be used, or pass additional configuration definition across to the application. This new feature enables your operations team to further ensure your specific policies and best practices are included in the application packaging process. We’ve released an important improvement to the Stacksmith API in the form of a documented CLI. These tools are designed to make it easy to link Stacksmith to an existing CI system such as Jenkins, TeamCity or CircleCI, and enable teams to get deployable artifacts whenever a change in their application code is landed. In combination with the release of the CLI, we are also implementing support for long lasting authentication tokens. Combined, these improvements enable you to embed and automate Stacksmith's processes into your existing pipeline. Using this CLI, you can enable automatic application rebuilds when dependencies or application code is changed. You can find this CLI, along with documentation and a sample integration, at https://github.com/bitnami/stacksmith-cli. We’re releasing the CLI in beta form at this point so we can better understand your use-cases and integration challenges. Issues and PRs are welcome on Github! Try out these new features on Stacksmith today, or reach out to our customer success team at customersucess@bitnami.com for a customized walkthrough.